Safety - Do you have a rock chip that requires rock chip repair or a crack that requires either a windshield repair or a windshield replacement? 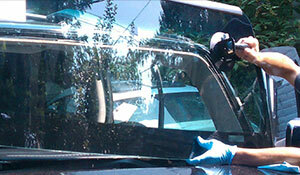 Safety is a huge concern when your driving a car or truck that has a damaged windshield. If you cannot see because the windshield damage is obscuring your field of vision even a little bit, your risk of being involved in an accident is elevated. Then you run the risk of injuring other people and yourself, as well as causing property damage. Even though windshield glass is designed not to shatter, it is still a possibility that it could. In addition, your windshield provides a structural element to how the front air bags work when deployed. A car's air bags inflate and push against the windshield to provide some cushion upon impact. If the air bags are already damaged and you crash, the structural integrity of your windshield maybe lost, diminishing the efficiency of the air bags deployment, which increases the risks of injury. The windshield in every vehicle provides a secure structural strength for the entire front of the vehicle. The windshield endures a good amount of stress pressure from the vehicle. Any flaw in the windshield glass leaves room for the possible deterioration of the front end of the vehicle's structural strength. It is against the law to drive with a cracked windshield as it causes an obstruction in your vision field. This means that any damage to the windshield glass may be a traffic violation. Any crack in your windshield, mainly if it right in your field of vision, needs to be repaired or replaced as soon as possible. There are several things that need to be considered when you have a damaged windshield. The financial cost is usually the biggest concern for most people, as they are unaware of how important the windshield is to the structural frame of the vehicle. The sooner you have a rock chip repaired or a cracked windshield repaired the less likely, you will need to have a windshield replacement done, which is more expensive than a windshield repair. So, don’t waste time get you car to the auto glass installers and at least have the damage evaluated. Take your vehicle to Only 1 Auto Glass they specialize in Auto Glass MN (that’s Minneapolis, St Paul, Twin Cities, and the surrounding areas. They will inspect you windshield and explain your options for windshield repairs, windshield replacements and rock chip repair. « My Windshield Has A Tiny Rock Chip. Does It Need To Be Repaired?